A wedding photographer’s job is simple: to capture memorable images of the bride and groom that will be framed and cherished forever. No pressure or anything! Most happy couples want traditional shots of their first kiss, first dance, and ceremony (you know, the kind of photos their grandparents frame and stick on the mantle), but taking the exact same shot over and over again can get tedious. How many classic portraits can one person snap without yearning to think outside the box? That’s where CreativeLive instructor Susan Stripling comes in. 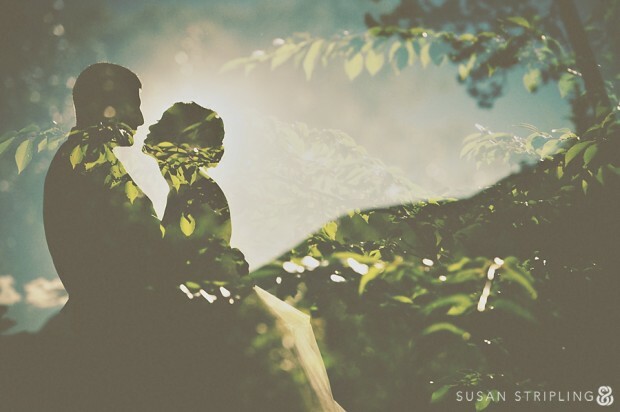 There’s no reason you can’t be creative with your wedding photos, and Susan has highlighted 10 ways to do just that. Your wedding pictures should tell the bride and groom’s story in a way that’s unique and different — after all, it’s what sets you apart from the competition! One simple way to do this is by experimenting with unusual angles. 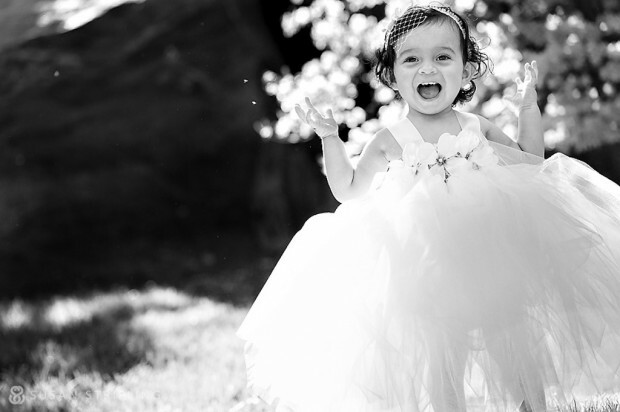 Want to transform a standard flower girl photo into an image that evokes emotion? Crouch down and take the picture from her level — suddenly you’ve entered her world, and the picture is rich and conversational instead of tired and predictable. Your bride and groom chose their venue for a reason, so highlight it in your photos! Did the happy couple pick their church because of its snazzy vaulted ceilings? You could shoot straight and miss those ceilings altogether, or you could angle your camera up and give them a starring role. 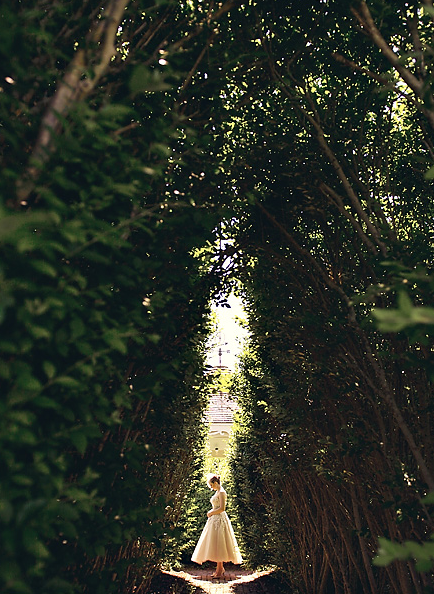 Shooting at an upward angle also eliminates clutter at the bottom of the frame (think semi-drunk uncles wandering around…) and allows you to focus on just the bride, the groom, and their gorgeous wedding location. There are only so many pictures you can take of a tipsy maid of honor toasting her BFF, so after you get a few safe shots, why not mix things up? Take the time to look at your surroundings and try shooting through them instead of at them. You can use any number of elements in the room and shoot through them — an empty water-glass, a flickering candle — and you can even go outside and take a few photos through a window. Just be mindful that your experiments have relevance and purpose so you’re continuing to tell the couple’s story. Shooting weddings can get boring if you aren’t inspired, but using your environment to your advantage can definitely give you a creative edge. Are the bride and groom getting married at a ranch? Steal (er, borrow) the bride’s Vera Wang shoes while she’s busy getting ready and shoot them on a broken down piece of furniture to give the photo some environmental contrast. The more you survey your surroundings, the more creatively you’ll be able to shoot the event. 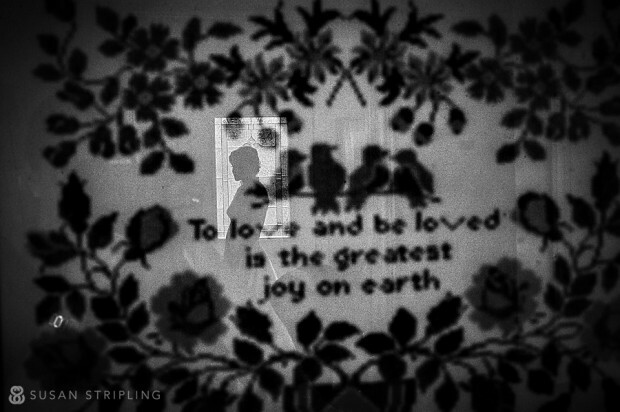 Multiple exposures are a great way to form a connection between the couple and a special aspect of their wedding. For example, if the bride and groom are getting married at the beach where they had their first date, layer their portrait with an image of the ocean or sand. And pro-tip: Susan layers her exposures in the camera’s actual settings, which means her photos are totally organic to the actual event. It goes without saying that your subject should be the focus of the picture, but that doesn’t necessarily mean they have to be right smack in the middle of the frame. Take a look at your surroundings once again and find a less obvious way to frame. Susan’s suggestion? 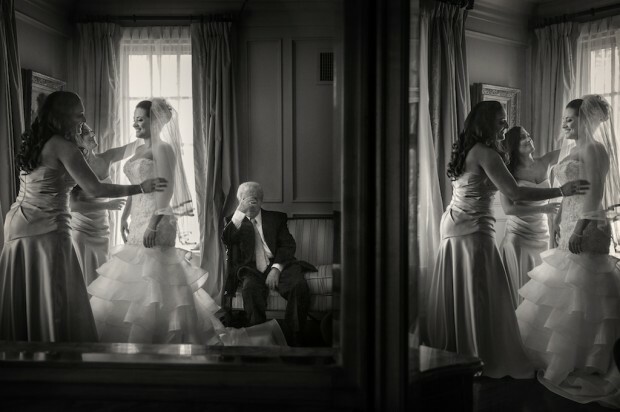 Search for a framing opportunity that tells a story about the couple’s wedding day. Whether you’re framing with a veil or a wedding ring, as long as it adds to the story and is graphically interesting, you’re good to go! There’s nothing worse than having some gigantic, ugly obstruction (looking at you, DJ speaker) in the corner of your image. The trick? Making it abstract and artful by shooting with anything from a champagne glass to a piece of fabric in the foreground. You’ll want to obstruct the undesirable part of your frame to help focus the camera (and the viewer’s gaze!) on the subject, which also happens to give you a great abstract feel. Fact: your background is your best friend. When it comes to photographing rings, shoes, or wedding dresses, they key is having an interesting backdrop to lend contrast to the subject at hand. Don’t fall into the trap of plopping rings on a table and snapping them against some tragic white wall. Instead, grab an item that’s representative of the wedding, whether it’s a flower arrangement, a stack of colorful bangles, or the bride’s something blue ,and make it the background of your shot. It gives the subject context, and ultimately makes the photo more fun to look at. Why limit yourself to telling just one story per picture? Instead, frame your photo in a way that tells multiple stories about the big day. Picture this: a bride is having her makeup done. You could snap a few pictures and deliver a decent shot, but if you broaden your framing horizons, you can also capture her mother’s face in the background as she watches her daughter get ready. Just remember, if you’re shooting multiple stories in the same image, both stories have to be strong or they aren’t worth telling. As much as Susan loves taking distinctive and singular photos, an image can often be at its most beautiful if its not overwrought or over-thought. Sometimes, a truly gorgeous “safe shot” of a intimate moment between family members or friends is all you need to make an image special, moving, and honest. 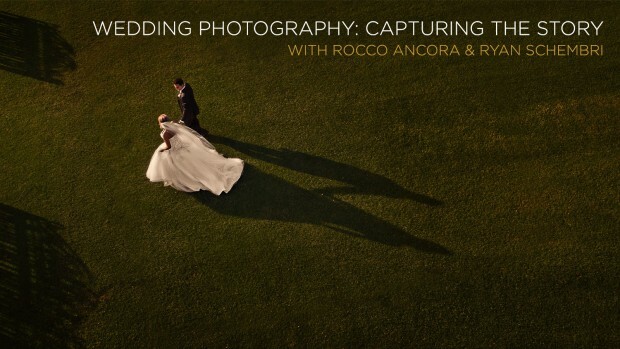 If you’re new to shooting weddings or have been shooting for a while and want some more inspiration, RSVP to watch Wedding Photography: Capturing the Story with Rocco Ancora and Ryan Schembri for free March 14th and 15th. What’s In Wedding Photographer Susan Stripling’s Gear Bag?